Thursday 18 January 2007: Viruses and Malware, How many more threats are there? Posted January 18, 2007 by grohling & filed under Uncategorized. Viruses and Malware, How many more threats are there? Our speaker was Stuart Taylor (right), head of the UK centre of SophosLabs™ Abingdon, Oxfordshire. 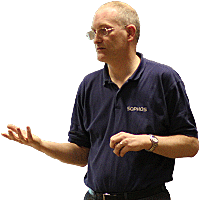 Stuart briefly discussed the history of Sophos starting in 1985 and the early years of anti-virus protection products. He then went on to discuss the scale of the threat and the escalating number of viruses in existence. Stuart has seen these numbers rise from a few hundreds ten years ago to there being now over 200,000 recorded. He spoke about how the profile of virus creators is changing. No longer are they misdirected amateurs doing it for a challenge; there is now money to be made and organised criminals are getting involved. Other forms of malware or threats are appearing such as spam, scareware and ransomware which can be designed to extort money from you. The threats are that the malware has removed data from your PC and you must pay money to get it back. He told us about tests carried out in his own labs where the survival time for an unprotected, unpatched PC attached to the internet to become infected averaged about 11 minutes. Today’s threat is more organised. Your identity and personal details are at risk. The battle between the IT security companies and the criminals is going to continue with new techniques emerging on both sides frequently. Only agility will keep security companies ahead of the game. Stewart quite reasonably prefers not to make his slides available on this, or any other website external to Sophos, because such material can easily go out of date.